Taichung, Taiwan's third largest city, will soon be home to a 985-foot, tree-like tower with eight leaf-like floating observatories. 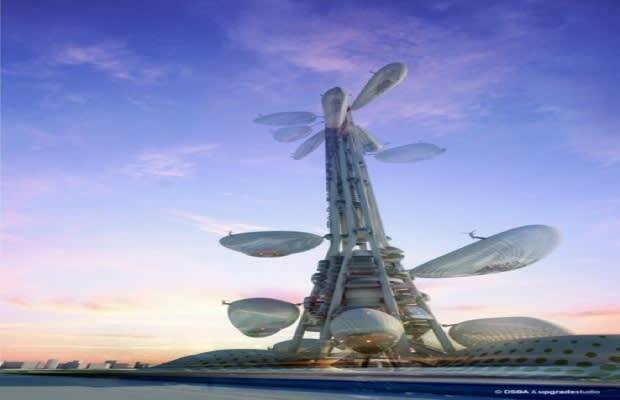 Inspired by science fiction and video games, the futuristic building will host a museum, office center, conference venue, urban park and several restaurants. A strong electromagnetic field and helium balloons will allow the 80-person elevator observatories to move along vertical tracks. Light and heat will come from a fiber optic dome and geothermal plant, respectively, while solar cells and turbines will generate power.